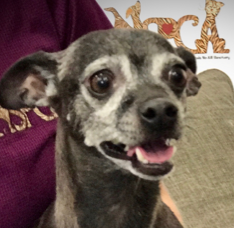 ***ADOPTED** Our Pet Pick, Pinto, is a 9-year-old Chihuahua with lots of love to give. He was surrendered to the Nevada SPCA by his previous owner because of health issues she had. He loves to play with toys and even other dogs his size. He is VERY friendly. His mom took very good care of him. She cleaned his ears and teeth every night and gave him regular baths. She requested we do our best to find this loving boy the perfect home. He deserves the very best. We thank Subaru of Las Vegas for sponsoring our Pet Pick of the Week and for their efforts on behalf of the pets in our community.